This is traditional italian made in many ways as per our style. This was made by my Husband who is a professional chef. Heat Olive oil in a pan. Add in the chopped garlic & onions & allow it to sweat without burning. Check the seasoning & add in the double cream & allow to reduce to get a thick consistency. Remove some separately & reduce further to make it a more thick sauce that is retained in the pan. Allow the reduced mix to cool & leave it separate. In boiling salted water blanch in the lasagne sheets & allow it to cool. Arrange the lasagne sheet & place a small amount of the mushroom mix in the middle & roll it over to make it a crecent shaped pasta. In a pan reheat the saved remaining mushroom sauce & add in little water to thin down. Once hot add in the cooked ravioli to heat up & get a coating consistency & serve hot. Can be served with sauteed mushrooms, grated parmesan cheese & chopped Parsley. Never tried pasta..looking creamy and yum.. Pasta especially when in white sauce such as this is always a fav with me. MUshroom ravioli makes me hungry, lovely work! well this is my all time fav though didnt tried it at home.. Very new to me,looks great Sri! A recipe from pro chef! Looks delicious! Love ravioli..Looks so inviting.The white sauce is so creamy and delish..
WOW ravioli looks delicious, yumm entry!!! 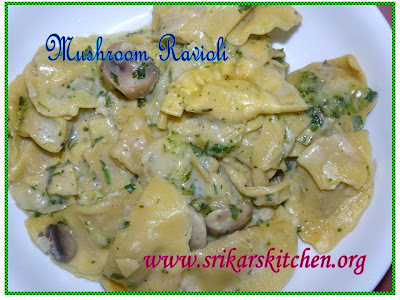 looks good..i hardly know any mushrooms recipe..will try this sometime..
looks so creamy and very much tempting. Mushroom ravioli sounds nice and healthy variation to me. Too good.